Once you have at least one option created, you can add the option to your products. 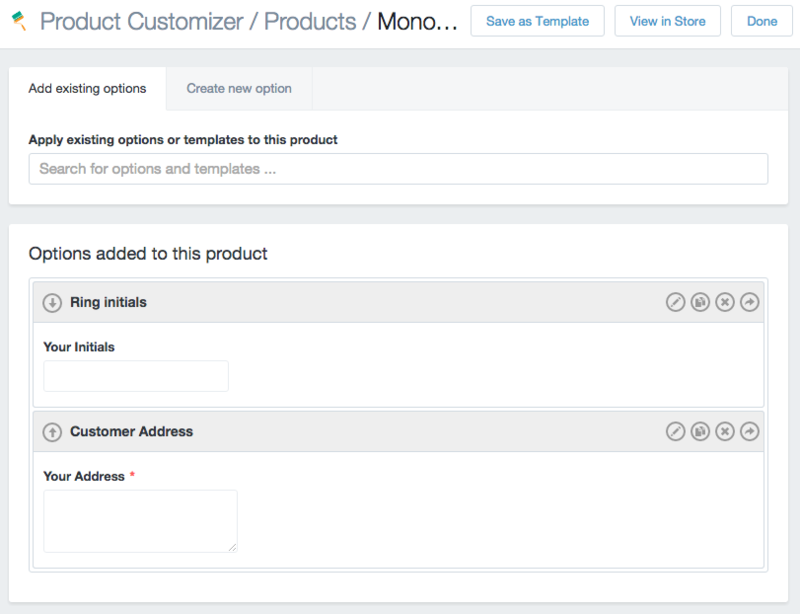 You can also quick-create a parent option while customizing a product if you find that you need a new parent option. Any parent option can be re-used across one or more products. This guide will show you how to add one or more options to a single product. 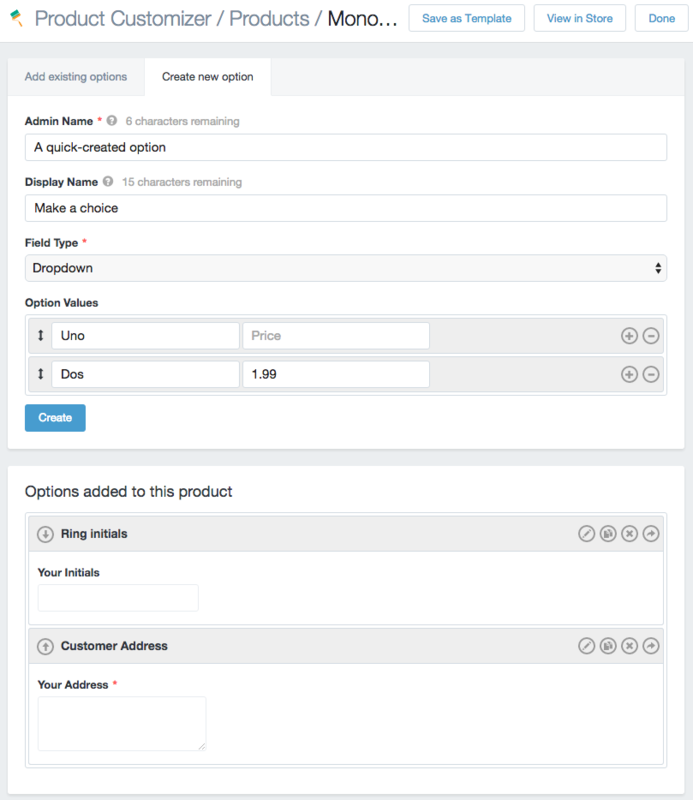 You can also bulk-add options to multiple products at once. Options can be created globally or overridden on a per-product basis. Regardless of whether you use existing options or quick-create options, you'll need to view your products. Go to Product Customizer > Products. 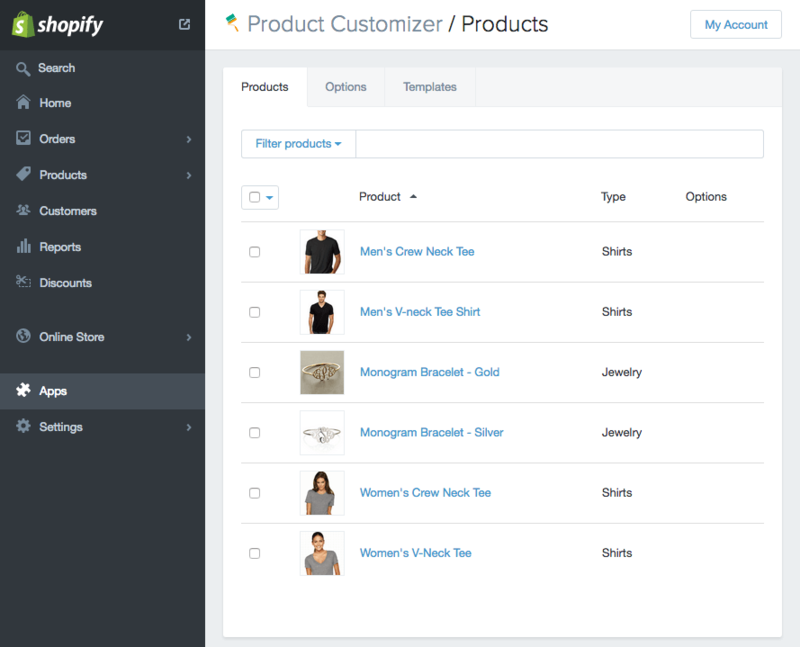 Here you'll see all of your products, and you can either add options to a single product, or multiple products at once. Apply Option to a Product: Click on the product name. This will let you search for options to add to the product. Click on the name of the option(s) you want to apply to the product. You can then re-order the options to display them as desired. When you're done, click "Done" in the top right to save the product. The options are now added! If you find that, while customizing a product, you need a new option that doesn't already exist in your options list, you can "quick create" a parent option from this screen as well. Click on the "Create new option" tab to quick-create a new option. This option will also be applied to the product, so you can now modify the child option if needed. Should you want to make changes to your new option that will apply globally to all products, you should edit this under the "options" list to edit the parent option. Options in your "Option" list are parent options. When you apply an option to a product, the product's option becomes a "child" of that option and inherits the characteristics or values of the parent option. When you update a parent option, the changes will be reflected on the product's child option, which helps you manage options easily across a large product catalogue. If you don't want a child option for a product to inherit from its parent in your Options list, you can override parts of the product's child option (for example, the Display name), and this part of the child option will stop inheriting from the parent. You can read more about this in our document on Managing Options Across Products.